In the wake of the increase in deaths from the outbreak of the Ebola virus in Liberia the Roberts International Airport the Nation's only international Airport says it is putting in place measures to help prevent the spread of the Virus. According to the Airport Public Relations Officer Mr. Ebenezer Wilson the measures may appear harsh but they are only intended to join National government in the fight to eradicate the virus from the country. He said, as of Monday all people without business at the airport including family members and well-wishers will not be allowed to enter the premises of the airport. 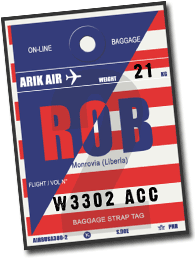 Wilson said: "RIA announces news access control measures amidst the spread of Ebola in keeping with the directive of the Ministry of Health and Social Welfare on the Ebola outbreak in the Country, the Management of the Roberts International Airport informs the general public especially those interacting with the airport that access to the airport's facilities will now be restricted. Hence, only those travelling and others doing business with the airport will be granted access into the port facility." During a tour of the airport by FrontPageAfrica it was observed that the decision was not welcomed by many who had gone to the airport to bid farewell or welcome their relatives, friends and love ones. They described the measure as harsh and strange noting that it is creating inconveniences for them who might wish to spend some time with their people before they depart. Also at the RIA 20 fire fighters returned home after undergoing training in Ghana. "In keeping with international best practice every airport should have a man power close to 40 to fight fire. Today we are receiving 20 of our staff who are returning from Ghana after benefiting from 60 days intensive training and the next 20 will shortly leave for similar training at the expense of the Airport," Wilson told reporters.